Karen Carpenter was unquestionably one of the most talented vocalists in pop music history. Along with her brother Richard, The Carpenters ruled in the seventies and early eighties. With their unique brand of pop, Karen’s silken soprano fit the songs they recorded as if she was born to sing them. And she probably was. Touch Me When We’re Dancing was the duo’s last Top 20 hit before Karen’s untimely death in 1983. Anorexia took this magnificent songbird from the world but she left behind a rich legacy of music that stands up today as some of the most contemporary sounding masterpieces of all time. The Carpenters remain a radio staple and its Karen’s magic that made it all happen. No one has to wonder what made Karen so special. As this video shows, she was more at home in front of the mike than she was anywhere else. 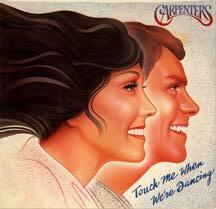 Touch Me When We’re Dancing is one of those classics that only The Carpenters could have made.